Diego is being supported by Fundación Karisma, the Colombian digital rights organisation. Karisma has launched an Indiegogo fundraising campaign to pay for legal expenses. As Communia, we are supporting the campaign and helping raise $40,000 for this case. 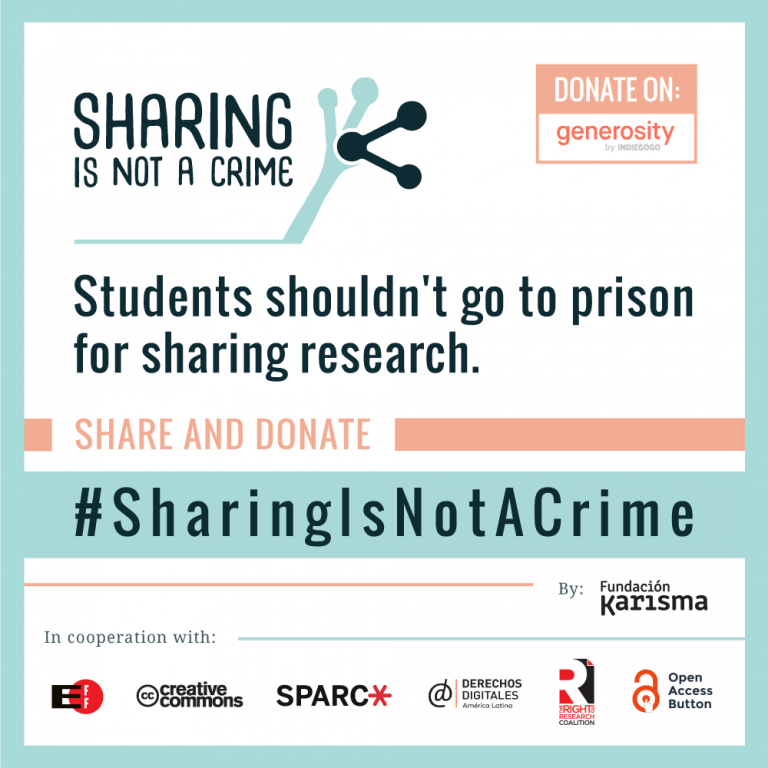 Please consider joining the Compartir no es delito: Sharing Is Not A Crime campaign. It is time to end an unfair case that has been a burden for Diego for the last four years. “The prosecution of Gómez is an egregious example of copyright overreach where rights holders can unfairly leverage the law so that even a minor violation leads to major negative repercussions for both the individual involved, and society as a whole. Students shouldn’t be subject to lengthy and stressful lawsuits for sharing knowledge”. Most troubling is the fact that criminal charges have been raised against Diego. A policy note on file sharing, prepared in 2011 by Prof. van Eijk from IVIT for the European Parliament’s JURI committee, notes that similar measures are available in Europe. Van Eijk notes that criminal law instruments are rarely deployed against individual users of file sharing. Nevertheless, they remain a loaded gun that can always be fired. Prof. Michael Carroll from American University in Washington, D.C. argues that a copyright system, in which file sharing becomes a criminal case, as a system that is broken. Last year, during consultations of the IPRED Directive, we argued against criminal prosecution of non-commercial file sharing. We keep Diego’s case in mind as we advocate for a copyright system that creates more user freedoms, as well as clear rules and boundaries. We believe it’s imperative for our copyright system to support strong exceptions for research and education purposes, and not criminalise the use of content. As Carolina Botero declares in the video above, “we need to find legal mechanisms that allow us to prevent cases like Diego’s from happening again”. We also need to actively oppose the rhetoric of copyright extremism, which asks for even more enforcement and penalisation of users. We need a copyright law that has, as one of its tenets, a strong belief that Sharing is Not a Crime. This entry was posted in campaign, international policy and tagged Diego Gomez, Karisma, open access, SharingIsNotACrime. Bookmark the permalink.